Pápai Páriz Ferenc, Album amicorum p. 365.
nomen, opes, famam, cumules hac arte perennem. haec pauca ex animo sperat precatur et optat doctissimo et florentissimo domino Francisco Paris Papai, Medico, Medecinae gratia peregrinanti, Daniel de Superville Medecinae doctorum filius, nepos et pronepos, nunc medecinae mentis intentus in verbi Diuini apud Rotterodamenses ministerio. Quicquid et Hippocrates ponit, solersque Machaon. Let everything open to you that Medicine keeps hidden, / let the secrets of nature and the weight of the things be known to you, / be Hippocrates, be greater than Machaon, / and know all the herbs that were known to Chiron, son of Phyllira, Aesculap of Epidaurus / and the oracle Apollo. / Be the healer of the world, let it be allowed for you / to bring back the deceased from over Orcus, and resuscitate the buried: / may you seize eternal name, riches and fame through this art. This few I wish, pray and desire from my heart to the erudite and eminent Ferenc Pápai Páriz, who sets out to peregrination for acquiring knowledge on medicine. Daniel de Superville, son, grandson and grand-grandson of physicians, and now preacher of the divine word for the healing of the soul among the inhabitants of Rotterdam. In Rotterdam, on December 6, 1719. Daniel de Superville. was born in Saumur in August of 1657, the son of the Niort physician Jacques de S. (?-1679) and of Marthe Pilet, grand-grandson of the physician Jean de S., and uncle of the physician and polyhistor Daniel de S. (1696-1773). The young Daniel began his studies in Saumur, reading Cartesian philosophy, literature and geography. Then he changed for theology, immatriculating in 1677 in Geneva, where he was registered as “Salmuriensis, theol. stud., huic albo nomen suum lubens apposuit”, that is, originating in Saumur, student of theology, who willingly wrote his name in this register”. He returned home in 1679, at the death of his father. The persecution of the Protestants urged him to go to England, but in 1683 he was invited to his native Loudun as a pastor. He worked here two years, but then he was denounced because of his sermons, and was summoned to Paris. After the revocation of the Edict of Nantes (1685) his mother fled to the Netherland, and soon he also had to leave France. In 1685 he became assistant pastor, and from 1691 pastor in Rotterdam. In commission of the Vallon Synod he supported the widows of the exiled preachers. During the peace conference of Utrecht (1713) he often travelled there in order to negotiate with foreign embassadors about the possibility of the restoration of the French Protestant church and release of Protestants sent to galleys, and collected donations for supporting those released. He retired in 1724 because of his illness, and was followed in his office by his son Daniel de S. (1700-1762). He died on June 9, 1728. His sermons and his monthly letters issued from 1691 on were also published in a collective edition. His great catechism of 1706 was reprinted several times; his book on the Lord's Supper was translated into German by Johann Gottfried Lessing. His works: Les veritez et les devoirs de la réligion chrétienne, ou Catechisme pour l'instruction de la jeunesse. Rotterdam, 1706. Amsterdam, 1708. – Le vrai communiant ou Traité de la Sainte cène et des moiens d'y bien participer. Rotterdam, 1718. De ware disgenoot aan des Heren tafel of verhandeling van 't H. Avondmaal … Rotterdam, 1722. Geistreiche Betrachtungen von dem würdigen Gebrauche des heiligen Abendmahls … ins Teutsche übersetzt … von M. Johann Gottfried Lessing. Budissin [Bautzen], 1728. 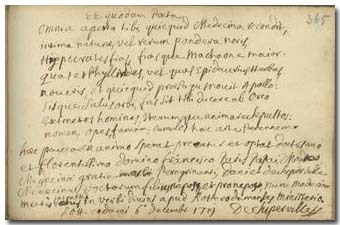 - Sermons sur divers textes de l'Écriture Sainte. Rotterdam, 1724, 1726. 4 vol. The son of Superville, at that time student of theology, wrote in the album some days earlier in Leiden (p. 403).